Most of the worlds examined in the study were very hot and large, with temperatures greater than 1600 degrees Celsius and sizes comparable to Jupiter. These conditions are far from hospitable to life, but excellent for phase measurements, the authors note. “We are getting to know these exotic alien planets as dynamic, three-dimensional worlds through remote sensing across vast distances. Someday soon we hope to provide similar weather reports for worlds not much bigger than the Earth,” says study co-author Jayawardhana, who adds that upcoming space missions such as TESS (2017) and PLATO (2024) should reveal many small planets around bright stars, making great targets for detailed studies. For the study, the researchers determined weather on these alien worlds by measuring phase changes as the planets circle their host stars. Similar to the Moon in the solar system, an exoplanet going through a cycle of phases can be traced, from fully lit to completely dark, when different portions of the planet are illuminated by its star. 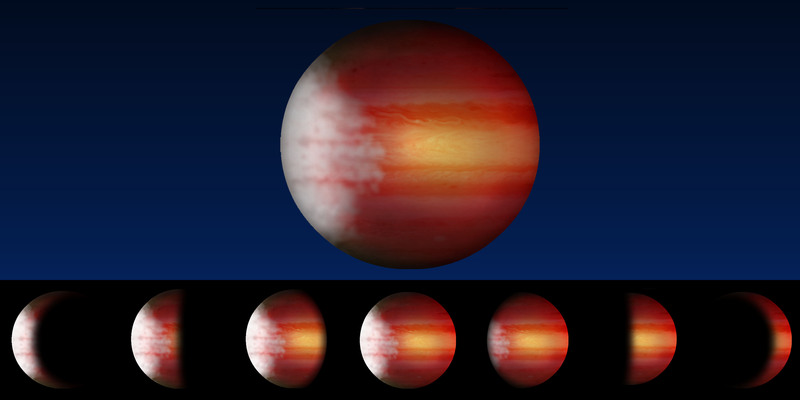 The Kepler space telescope was the ideal instrument for the study of exoplanet phase variations, according to the researchers. The telescope’s very precise measurements and the vast amount of data it collected over its initial four-year mission allowed astronomers to beat the noise and measure the tiny signals from these distant worlds.